Our outdoor teaching and learning ethos has always been a key part of how we develop our children’s interest and understanding of curriculum subjects while they are at Meath Green Junior School. As a result of this, we pursue different ways of capturing children’s imagination as a stimulus to lifelong learning. With the help of children we have now planted an unusual specie of tree called, Ginkgo biloba or maidenhair tree. The Ginkgo tree is a living fossil, with the earliest leaf fossils dated from 270 million years ago. It was rediscovered in 1691 in China and was brought to this country in the late 1700s. The seeds and leaves have been (and are still today) used in medicine throughout the world. This tree has been described as a ‘living fossil’ because it is the sole survivor of an ancient group of trees older than the dinosaurs. 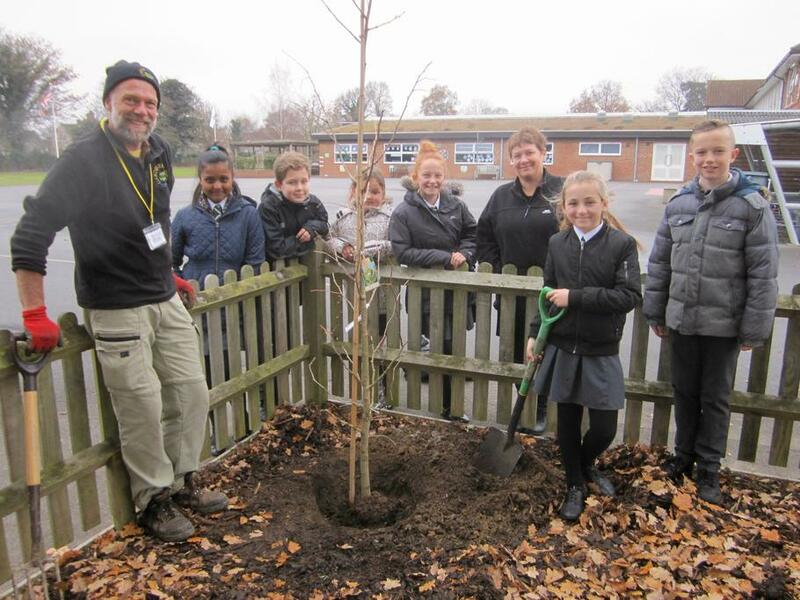 Our children found the history of this tree fascinating and with the help of the school’s horticultural advisor, Mark Dobell from Gardener’s Den Ltd they planted the young tree in our Science and Vegetable garden. Now all children who visit and work in the Science garden will enjoy seeing the tree they have dubbed ‘The Dinosaur Tree’, develop alongside the many more familiar vegetables that grow every year. This remarkable tree is known as a 'living fossil', as it is the sole survivor of an ancient group of trees that date back to beyond the time of the dinosaurs. Ginkgo fossils are common in the rocks of the Jurassic and Cretaceous, but today Ginkgo biloba is the only member of its genus, which is the only genus in its family, which is the only family in its order, which is the only order in its subclass. Maidenhair tree remains virtually unchanged today and represents the only living bridge between 'higher' and 'lower' plants (between ferns and conifers). Maidenhair trees can be extremely long-lived, the oldest recorded individual being 3,500 years old.